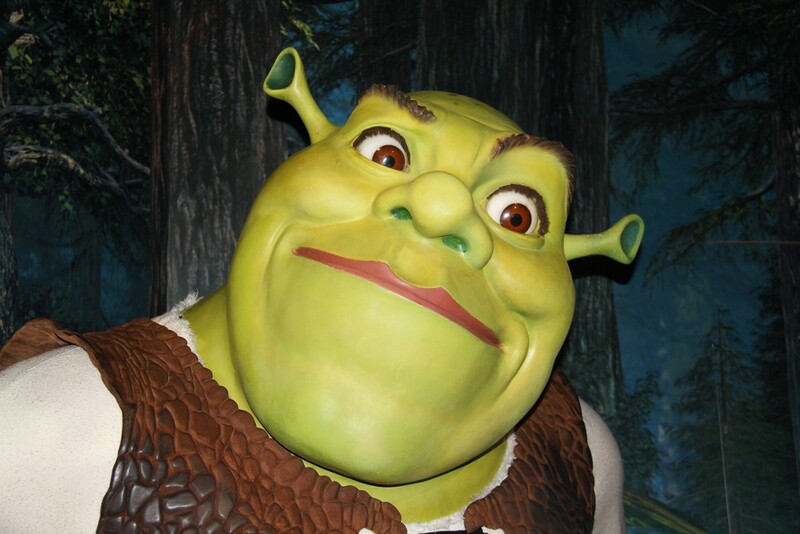 In the spring of 2001, a few months after George W. Bush was sworn in as president and a summer away from 9/11, Americans flooded movie theaters to watch a computer-animated fairytale about a swamp-dwelling ogre. Shrek was based on a children’s book by William Steig, but for most, this Cannes-premiering film served as an introduction to the character who would from that point forward be known for his Scottish brogue — provided by Mike Myers — and unblemished yet booger-green skin. But a curious thing happened when the franchise all but petered out around the turn of the decade: On niche social platforms from Tumblr to 4chan, people were creating and sharing original Shrek content — Shrek memes, puns, shitposts, videos, and barely ironic fan art. By 2012, these obsessives were calling themselves “brogres,” after “bronies,” the male fans of My Little Pony, and establishing dedicated groups and pages for their surprising hobby. The further we got from the era of Shrek’s box-office dominance, the stupider it seemed — a hodgepodge of limp references and dated visual effects. But its forgetability just fueled the memes, which spread to new services, including Vine. Distance also enhances nostalgia, a driving force of virality; a generation that grew up on the movies could now turn a mischievous eye on the material. As David Sims theorized for the Atlantic in 2014, Shrek had come to signal a certain time and the national mood that attended it, a cusp-of-the-century blandness and the quick-fading novelty of each innovation it gave us. Shrek was less a narrative than a market object or, more accurately, a brand — a $5 DVD sold from a bargain barrel in Kmart. Many memes rocket from nowhere to complete saturation only to flame out even faster, yet Shrek is tied to real-world experience that cannot be cast into a landfill like so many Shrek toys from McDonald’s Happy Meals. The shine was already off, meaning Shrek adherents could mine its irrelevance for laughs, always finding another angle of attack — like torturing Smash Mouth by repeatedly nodding to the band’s appearance on Shrek’s soundtrack. (The song “All Star” is a meme all its own, signifying a similar vein of mainstream millennial junk.) Also, heads up, someone is currently role-playing as Shrek on Tinder. A funny thing about Shrek is his apparent solidity, despite of the fact that he’s pure digital confection — all brawn and belly and masculine stubbornness. This paradox makes him the perfect figure to endure the cycles of a fickle internet, a monster both ephemeral and immovable. Shrek’s home, the swamp, is as fitting a euphemism as any for the web. If you go there, you’re bound to find him. At this point, should some artificially intelligent neural network wipe out humanity, it would be left to reckon with the semiotics of all this substance, this undifferentiated Shrekness that flowed through our systems of thought and communication, reproducing like a mold, mindlessly and without purpose. It would conclude that we wanted that, encouraged that, basking in the strange effect. It would never guess that Shrek was an avatar of everything we’d lived and lost before it was over, and therefore essential to understanding the pace of the future. He’s a stepping stone that we picked up and carried with us on a death march to singularity. 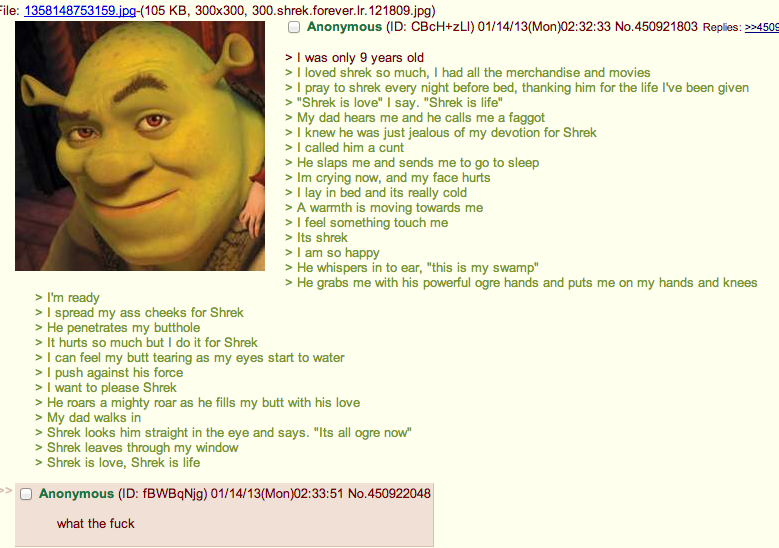 The truth is, Shrek was made to be left behind — and that is why we cannot let go.